Went on a job interview recently and it left me lingering on a few different things that I haven't really given much thought to. Without giving away the money shot, I work at a non-profit as a communications manager. Fancy titles aside, I'm basically the person in the office that handles the posting, sharing, creation etc. of everything that can fall under communications. From writing/sending email newsletters, posting on social media, managing press, and light manual labor from time to time. This allows me to live comfortably enough that I spend around $50 a month buying comic books without having to think twice about it. As someone who has been working some kind of job ever since I could remember, this is my current pinnacle given that I live my life two years at a time because of my DACA work permit and quitting community college after seven years of back and forth. This job I interviewed for was a full time gig doing basically the same thing I'm doing now, but full time and in a much larger capacity. That gig would have given me the kind of pay beyond anything I have ever had within my life time. For a cool minute, I let myself think about the kind of life I would have if I had a legit full time gig like that. I looked forward to the idea of not having to have two part time jobs and side hustle anymore. To go into the office, do my thang Monday through Friday, and occasionally on weekends, and not have to worry about money. However, I didn't let it get past the bus ride home after that interview because that ain't for me. For all the skills to pay the bills that I have, I doubt I'll get called back for a second interview. As such, I got to thinking about it. I have never truly felt comfortable owning the skills that I have for two reasons, one being that I procured said skills to pay the bills through a combination of "each one teach one" back when I was part of the "Dreamer" movement, and a few years of being a writer for my college newspaper. Secondly, I just never take myself too seriously when it comes to the work that I do for a lot of complicated reasons. The years I spent in community college and at the school newspaper got me where I am today because I just took what I learned and applied it else where. I got a rush from writing stories and seeing them in print, knowing that someone would read it. I didn't get the same rush when I began blogging here, but I did get it when I started blogging about the neighborhood I live in, Boyle Heights. I look back at those old post from time to time and I cringe at how bad my grammar was because I didn't have someone to copy edit me like I did at the school paper. None the less, despite my horrid grammar, I was sharing things no one else was and by default, I became the go to person. My neighborhood was my beat and in the hay day of this blogging/reporting, I was having the best time of my life despite being broke as a joke, working part time at a fast food restaurant, going to school part time, sleeping on the floor of a friends house, using a first generation iphone as my digital tool box to take pictures and write stories that I would later flush out on a borrowed computer. I had everything going against me, but I kept at it over the years and I got lucky here and there by scoring some paying gigs from time to time. Boy I tell you what, there wasn't a better feeling than getting paid to write. 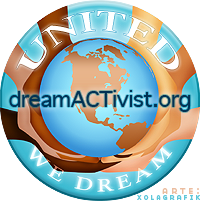 Through said writing I was able to connect to folks that were holding down the Dream Act movement back in the day. Eventually I got to the point where I had met in some shape or form, some of the folks that helped build the foundation of this movement here in California. Eventually I gave up on journalism because I didn't want to be a reporter anymore. Being objective wasn't something I could be back then, so rather than writing about the movement, I joined up and put my skills to use there. Like a lot of folks back in those early days, we just did work and made it happen one way or another. Over the years, I added even more skill-sets that complimented the foundation I already had. I worked media with a homie I've had the pleasure of knowing for years now. Naturally, as my skills and maturity grew, I took my skills to the next level by doing internships at labor unions and learning, complimenting everything I picked up when I was in the "dreamer' movement. Before I knew it, I had a reputation for being a 'communications' guy. Fact of the matter was that I just knew how to do the most basic of things when it came to doing digital organizing. I didn't see the need for me to go into a university and get a degree in something I already knew how to do better than most folks that got paid to do that work at established organizations. They would come to me for help when trying to do things, but the name of the non-profit game calls for those fancy degrees and eventually I just faded out on everything and got to a place where I could finally live on my own. Within the circles I was in, I was able to get multiple part time jobs that allowed me to put my digital organizing skills to use and make a living, which to me was the pinnacle of my career since that was never my plan. I haven't taken full ownership of my said skills because it doesn't feel right to be making bank off something that was shared with me with the intention to help me grow, rather than make money. Which leads me to why I have never taken my skill-set seriously. I acknowledge that I am where I am because I am good at what I do, but I am not perfect. My current job situation is one where I have never been happier to be part of an amazing space and get support in the work that I do, but my limits are starting to show. Only so much time can pass before what amazed folks in the beginning is now just another common every day occurrence. Even I get tired of doing what I do every day, at the end of the day a job is a job. There are plenty of new skills I can add to my tool box not just because I like keeping up with trends, but because that's how fast digital organizing moves. So many things to keep up with everyday that I get overwhelmed sometimes and that's part of why I don't take my skills seriously. I read so much crap on a daily basis from being on social media that by the time I get to work I already have a headache and I'm annoyed by the trends going around. Being able to read through all this crap is a double edge sword cause while I shift through everything to find the good stuff to read or share, I have to eat double that in what I see other people posting online. These trends change daily and while they can be predicted around specific times, instances, moments etc., they change twice as fast. I'm over here trying to make sense of snapchat while everyone else lives on it. Next thing I know I'm yelling at kids to get off my lawn while shaking my fist in the air. So much drama tied to our digital lives now that I can't take it seriously without being heavily drugged on something. Then before I know it, I started another twitter fight that leads to hella indirect black mailing with something else that had nothing to do with it. Bruh, chill. And yet, there in lies my problem, I forget that not everyone else doesn't not take it seriously. They take it seriously. And so conversations are had, butts get hurt, and things move along.